We supply Computerised Management Systems and Services for Commercial Shipping, Industrial and Military land/sea/air applications. Isherwoods unique IMIS® software integrates these systems into a single easy to use software package. The software is designed to be installed and run on user friendly Microsoft Windows™ platforms which require low cost initial investment in computer hardware and subsequently low operating costs. Our other services include authorship of Technical Publications and Application Software Development. We specialise in providing full turnkey solutions complete with application software, comprehensive database preparation, data entry, installation, commissioning and training services. The benefits of using Isherwoods IMIS® Systems include increased operational efficiency, maximised availability and reliability, lower operating costs and accurate documentation. Our professional employees include marine, mechanical, electrical, electronic, weapons and logistics engineers and information technology experts. We always aim to develop and improve our products and services and in particular to provide a flexible response to individual customer requirements. Isherwoods has an international client base and has now delivered its systems to over 38 countries worldwide in several different languages. Isherwoods UK office is about 7 miles (11km) from the city of Newcastle upon Tyne. We are based in the Centre for Advanced Industry, at Royal Quays, North Shields., close to the North Shields Sea Ferry Terminal (see below). For visitors travelling by car or taxi, please select the map icon for full directions. Newcastle has high speed rail links with London and most other UK cities. Travel from Newcastle Central Train Station to our office by taxi takes about 15 minutes. Port of Tyne, North Shields International Passenger Ferry Terminal has frequent ferries to serveral European destinations. From Ferry Terminal to our office by car or taxi takes about 2 minutes. By compliance with recognised Quality Standards we aim to maintain the highest standards of production output and customer care. 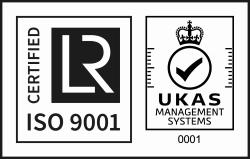 Isherwoods have been accredited with the ISO 9001:2015 standard. Sir Joseph Isherwood Limited takes data privacy very seriously and is fully prepared and committed to compliance with the General Data Protection Regulation (GDPR) introduced in the UK and Europe on 25th May 2018. Please see the following documents GDPR Compliance Statement and Data Protection - GDPR Policy for further information. For the past 40 years Isherwoods has provided Management Systems to more than 100 customers in 38 different countries, with over 400 systems delivered in several languages. Isherwoods began trading in 1907. The founder, Joseph William Isherwood, was a respected naval architect who designed and patented a revolutionary system of construction for seagoing vessels using a longitudinal framing system. By 1918 about 1,050 vessels had been constructed throughout the world. Joseph Isherwood later received a knighthood in recognition of his contribution to the maritime industry. In the 1930's he developed the 'ARCFORM' hull design to improve fuel consumption and 50 ships were built to that design between 1933 and 1954. In the 1960's Isherwoods started to provide Ship Management Systems to ship owners and operators. The first manual Maintenance Management and Stock Control system for commercial shipping was produced in 1963. Computerised Stock Control and Planned Maintenance (SCPM) systems soon followed. Since 1980 the company has increased the scope of its business market, winning further contracts with government, military and industrial customers. Our primary business activity now is the supply of computerised Maintenance Management Systems (MMS) or Integrated Logistic Support (ILS) Services to Commercial Shipping, Industrial and Military markets. We have made many improvements since the first manual based systems of 1963 to the current IMIS® based system today. We now use Microsoft Windows™ technology to extend the functionality of our systems and to integrate Maintenance, Supply, Configuration and Document Management. We can now produce interactive electronic technical publications, or if necessary we can also meet the ongoing demand for hardcopy printed publications. Our investment in software development and keeping up with the latest available information technology will allow us to continue introducing improved integrated software applications in the future.